On Monday, the Dallas Cowboys released wide receiver/kick returner Lucky Whitehead after reports circulated there was a warrant out for his arrest in Virginia. Less than 24 hours later, the Prince William County Police Department said he was misidentified. Whitehead’s agent David Rich told ESPN’s Todd Archer that three or four teams have reached out about his client since the news broke Monday. Whitehead played in just 143 offensive snaps in 2016, finishing the season with a 47.6 overall grade to go with a 61.5 receiving grade. His largest contributions came as a returner on special teams. 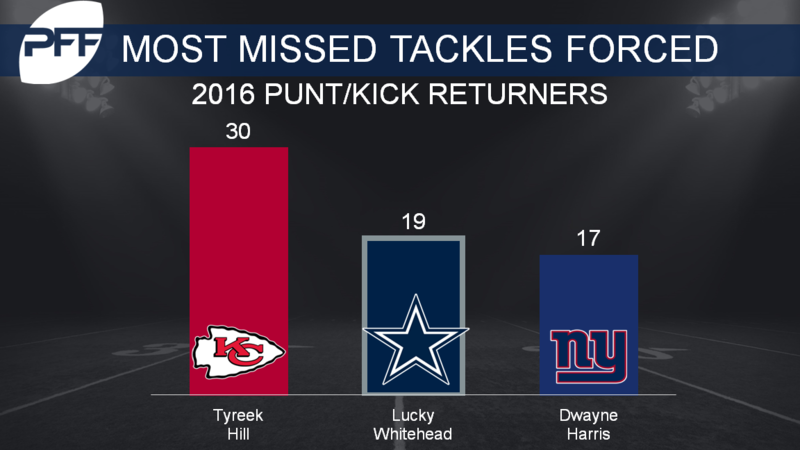 Whitehead’s 19 forced missed tackles on kick/punt returns ranked second among all return men in 2016, while his 15 returns that forced at least one missed tackle ranked fourth.